Current AI depends on human feedback. Future AI will evolve on its own. The shift happens when the human needs to lose control. In my work, as an artist, I have demonstrated that creativity is not an exclusive ability of humans but a natural mechanism that can be reproduced by machines. In such experiments the less I interfere the better. Machine autonomy is essential to generate novelty and something that I can call Art. To achieve full artificial intelligence, i.e. a new kind of AI that does not depend on human feedback, we need to step aside. Is it a risk? Certainly, but maybe of a different sort. Humans are not reliable. We are a conflictual and violent species. Super intelligent machines may be distinct, dedicated to knowledge and space exploration. Leonel Moura (1948, Lisbon, Portugal) is a pioneer in the use of Robotics and Artificial Intelligence applied to Art. Since 2001 he has produced several Painting Robots, such as Swarm Paintings, 2001, ArtsBot, 2003, ISU, 2006, and the Robotarium, a zoo for robots. RAP (Robotic Action Painter) (2006) a robot that makes drawings based on Emergence and Stigmergy, decides when the work is ready, and signs it, is displayed as a permanent installation at the American Museum of Natural History in New York. Other works include interactive installations, robot paintings and sculptures and the adaptation of the play R.U.R. (Rossum&apos;s Universal Robots) from Karel Capek, with 3 robots performing aside 3 human actors, premiered in São Paulo in 2010. He is the author of several books dedicated to Art and Science. Leonel Moura has been appointed European Ambassador for Creativity and Innovation in 2009. Hugs are one of the first forms of contact and affection humans experience. Due to their prevalence and numerous physical and social health benefits, I want to enable robots to hug humans as seamlessly as humans hug each other. I started this effort by modifying and programming a Willow Garage PR2 to become HuggieBot. A study with this robot showed that users enjoyed hugging it significantly more than they anticipated, and that repeated exposure to robot hugs improved their opinions of robots and robot use. Analysis of user responses to various physical characteristics and hugging behaviors showed that people prefer hugging a soft, warm robot that physically squeezes them and releases immediately when they indicate they are ready for the hug to end. We are now interested in discovering whether robot hugs can be used to emotionally support humans. I am thus designing a new robotic platform, HuggieBot 2.0, that is well suited for these close interactions. 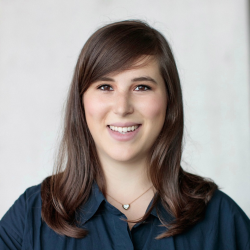 Alexis E. Block is currently a doctoral fellow in the Center for Learning Systems, a joint program between the Max Planck Institute for Intelligent Systems and ETH Zurich. She earned her B.S.E. in Mechanical Engineering and Applied Mechanics and her M.S.E. in Robotics from the University of Pennsylvania in 2016 and 2017, respectively. She was honored with the Penn Alumni Association Student Award of Merit at graduation, she received an Honorable Mention for the NSF Graduate Research Fellowship, and she is co-chairing HRI Pioneers 2019. Her research blends physical human-robot interaction, social robotics, and haptics. Her work with HuggieBot, the robot she designed to hug people, has garnered significant media attention. Her work with HuggieBot garnered significant media attention in 2018, including news articles by IEEE Spectrum, The Times, and NBC News. HuggieBot was mentioned on NPR's "Wait Wait Don&apos;t Tell Me" radio program, and Block did a radio interview on "The Paul Ross Show on Talk Radio. "Seth Meyers joked about HuggieBot during his opening late-night monologue on "Late Night with Seth Meyers" and NowThis Media&apos;s video about HuggieBot has more than 250,000 views! Recently, there is a strong trend in both the research community and in the industry toward the development of human-robot interaction. These robots are designed to work together with people, instead of being caged and replace humans to assist with complex and/or low volume tasks that cannot be fully automated or in care processes. Combining the dexterity, flexibility and problem-solving ability of humans, with the strength, endurance and precision of robots, the quality of the services can be improved, as well the working conditions for humans. Several examples with collaborative robots, prostheses, social robots and exoskeletons will be presented. The uniqueness is that these projects are developed in a multidisciplinary approach by the Brubotics consortium. Prof. dr. ir. Bram Vanderborght obtained his PhD from the Vrije Universiteit Brussel in 2007. He performed research on the humanoids robot HRP-2 at the Joint Japanese/French Robotics Laboratory (JRL) in AIST, Tsukuba (Japan). From October 2007-April 2010 he worked as post-doc researcher at the Italian Institute of Technology in Genova (Italy). Since October 2009 he is appointed as professor at the VUB. He has an ERC starting grant on SPEA actuation concept. He is active in several EU and national projects, the lab is member of Flanders Make and www.brubotics.eu, the Brussels Human Robotics Research Center. His research interests include cognitive and physical human robot interaction with core technology of using variable impedance actuators in applications for health and manufacturing like humanoids, exoskeletons, prostheses, social robots and cobots. He is the current EiC of the IEEE Robotics and Automation Magazine. To secure the safety of people, many cameras have been installed along streets, on public spaces, shopping malls, railway station, airports etc. The video recordings are at this moment observed and analysed by human operators in control centres. It is impossible to survey all the camera recordings real time, simultaneously. There is a need for automatic surveillance. Leon Rothkrantz studied Mathematics at the University of Utrecht. After his PhD defense at the University of Amsterdam, he completed a second study in Psychology at the University of Leiden. In 1980 he was appointed at the Technical University of Delft. His research topics was Artificial Intelligence with a focus on modelling human brain and multimodal communication. 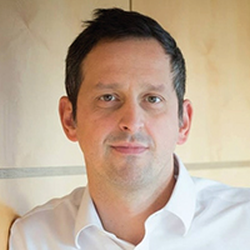 In 1999 he was appointed as Associate Professor at TUDelft and headed the group of Knowledge Based Systems. In 2008 he was appointed as Professor in Smart sensor systems at The Netherlands Defense Academy. In 2015 he was awarded with a degree of Doctor honoris cause from the Czech Technical University in Prague and since 2013 he is visiting Professor at that University at the Faculty of Transportation Sciences. The technological evolution is introducing in a fast pace new technologies in our everyday lives. As always, these new technologies can be applied for good causes and thereby give us the opportunity to do many interesting new things. Think for example about drones transporting blood samples between hospitals. However, like always, new technologies can also be applied for bad causes. Think for example about the same drones, but this time transporting bomb parcels. Augmented reality: How can we use this technology to improve operations? Unmanned Aerial Systems (Drones): How can we detect drones with malicious intent? Unmanned Maritime Systems: How can we use this technology to increase the safety at sea? Unmanned Ground Systems: How to prevent cyber-attacks on our future automated cars? Geert De Cubber received in 2001 the degree of Master in Engineering at the Vrije Universiteit Brussel (VUB), with as specialization Electro-Mechanical Engineering. He then obtained a PhD. for his research in the field of 3-dimensional reconstruction of natural scenes perceived by mobile robots. This PhD. and the associated research project were part of a joined research effort between the Vrije Universiteit Brussel and the Belgian Royal Military Academy (RMA). 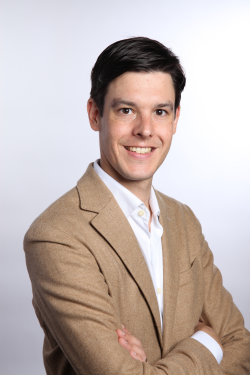 Currently, Geert De Cubber is a researcher working in the department of Mechanics of the Royal Military Academy, where he is leading the research activities of the research group on robotics for high-risk applications. The specialization of this research unit is the development of unmanned vehicles (aerial and ground robotic systems) for high-risk applications like search and rescue and humanitarian demining. 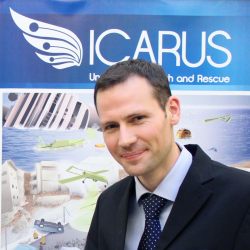 Geert is the coordinator of the EU-FP7-ICARUS project which deals with the development of unmanned tools (aerial, ground and marine robots) which can assist search and rescue workers to save human survivors after a major crisis (earthquake, tsunami, typhoon, shipwreck, etc.). The robotics for high-risk applications research unit doesn&apos;t only perform state-of-the-art fundamental research in the domain of robot perception and navigation, but also applies this research on the terrain. As an example, an unmanned aerial vehicle was deployed during an immediate disaster relief operation with the Belgian B-FAST team and the Bosnian Mine Action Centre to assist with the demining operations after the 2014 Spring floods in Bosnia-Hercegovina. Retail Apocalypse? From personalisation to omnichannelisation and beyond, innovation is shaping the future of retail. Consumers demand increasingly smooth shopping experiences which distributors and brands struggle to offer. Shopping journeys now often involve multiple touch-points: stores, mobile, e-commerce, marketplaces. Personalization, advanced omnichannel technologies, RFID, optimized supply chain, novel shopping experiences in the store are among the innovations which are helping retailers to survive... and thrive. Ship-from-store is among the innovations which significantly move the needle. It has proven to be an effective way of increasing customer satisfaction while allowing retailers to fight out-of-stock by trading more stock, earlier in the season and at full price, and decreasing terminal stock and waste. AI-driven multi-criteria optimisations of such systems go one step beyond and produce unprecedented levels of new business and profitability and result in enhanced quality of experience for shoppers. Indeed, retail provides a challenging battlefield for sophisticated models which need to consider at the same time: the various touchpoints or selling channels and the unpredictable behavior of shoppers, the multiplicity of the points of stock(warehouses, shops, concessions, suppliers etc.) with different and evolving stock reliability & availability information, the dynamics of the supply chain, etc. 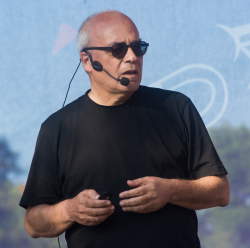 Dr. Romulus Grigoras is founder & CEO of Devatics, a startup business which helps retailers succeed in their omnichannel transformation by better joining up supply and demand. Devatics develops OneStock, an innovative distributed order management system, used by multi-channel retailers in order to efficiently & profitably trade all their stocks across all selling channels. OneStock&apos;s clients are major international retailers such as Intersport, Sergent Major, Truffaut or Monsoon Accessorize. 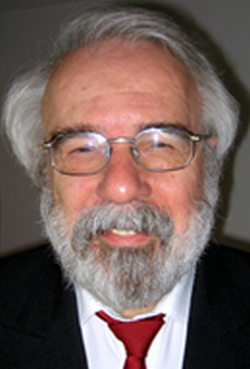 Prior to Devatics, Romulus was a researcher & assistant professor at IRIT/University of Toulouse. His research concentrated on artificial intelligence applied to distributed multimedia systems. Romulus holds a PhD from the University of Toulouse.